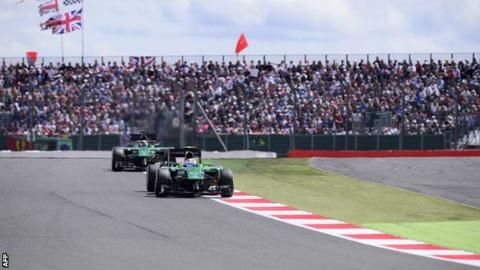 Silverstone's new managing director wants to lower ticket prices for the British Grand Prix. Patrick Allen was appointed boss of the F1 circuit earlier this month, and wants to knock up to £56 off tickets for race day. "What I would like to do is see ticket prices falling for the British Grand Prix," Allen told BBC Look East. "In my mind I have the benchmark of a £99 admission ticket. I think that's what customers deserve." The plan, which is intended to raise the number of spectators over the race weekend and would be balanced out by an increase in concession sales, would not be active until the 2016 race, at the earliest. An adult, general admission raceday ticket for the 2015 Grand Prix is priced at £155. "I would much rather see better ticket offers and once people are here, do more for them," said Allen, whose background is in marketing. "If you want to get more people here every year, you don't do that by putting the ticket prices up. We are desperately trying to bring the ticket price down." Allen has taken over the running of Silverstone Circuit Limited, the company that manages the track on behalf of the British Racing Drivers Club, after the departure of his predecessor Richard Phillips. The BRDC had attempted to sell the circuit, until a deal fell through in May, and Allen expects the current owners to remain committed. "Yes it's true they tried to sell the circuit. That didn't happen for whatever reason," he said. "They are very much concentrating now on making this a successful venue. You can never say never, but for the foreseeable future we have to build this business. "Right now my remit from the BRDC is very clear, which is to make this a profitable, blue riband venue."